This post was a mother and daughter effort. Our eldest visited for the week end from Toulouse, where she’s doing her last year in architecture. 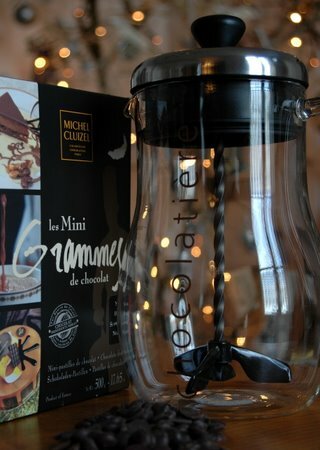 Sharing a love for art and camera and food, we worked in a team to do “cocolat chaud à notre façon”. A mere twenty two years ago, she was sitting feet and all on the kitchen counter, licking from the mixing bowl. Now she is as apt at living an adult life as she was then at licking a bowl. I enjoyed this experience with her, making our hot chocolate, setting up for the photo shoot, choosing the best shot and ending with sipping our chocolat chaud. Heat up a cup of milk per person. Melt about 1 heaped tablespoon of cooking chocolate chips (70% cocoa) per cup, together with 2 tablespoons of water. Alternatively you can use 125 g of dark chocolate to 250 ml of milk. Add the melted chocolate to the hot milk and simmer gently for about 5 minutes. Remove from the stove and whisk with a frother(or in a chocolatiére) until foamy. Pour into cups and sprinkle with cocoa. Serve with brown sugar lumps on the side. For a creamier version, replace some of the milk with cream. Add mint leaves to the milk to infuse and remove before adding the chocolate. Serve, topped with a mint leave, dusted with icing sugar. Add a cinnamon stick to the milk and infuse. Add some orange peel to infuse with the milk and serve afterwards with sugared orange peel dipped in chocolate. Oh, I just looked through your art work. Truly amazing. You are really great with colors. Ronell – a lovely post! Oh what a wonderful blog you have here! I really love the photos and your art is just my kind of thing. I’ll be back often, thank you! I love your hot chocolate recipe! I will try it. The photos are fantastic! Oh that looks irresistably delicious! 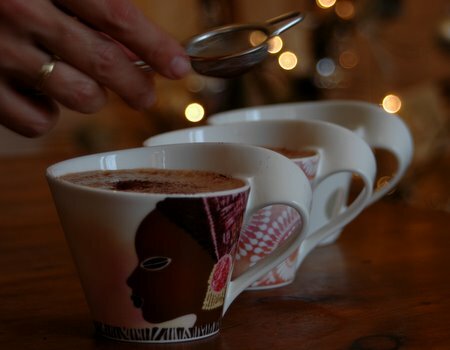 I adore hot chocolate – from the Nequik variety right through to super-decadent bicerin, with a swing through the spicy Mexican variety on the way. All good. Btw, where did you get those fab cups from?? OMG… I can’t resist this one, I think I’m gonna make it right now… BTW, I love your blog. Thanks for the post! Mmmwah!